MINNA GILLIGAN: Your aura is purple! These are just some pictures of stuff that coloured my day today. First is a great 1970s book on Tarot cards. Now all I need is, ah, a deck of tarot cards. I think my sister has one... It would be so cool to be able to read people's palms and junk. Probably would be a good party trick. The second image is of a beautiful card I received in the mail today from the lovely Clara Lipfert. She sent me a copy of her Zine 'Paper Doll'. Her blog is here. The last image is of my new poster that faces my bed. It's from Annie Hall and I love that it's a still from the super awkward scene on the balcony and especially how Annie is drinking from a water glass not a wine glass and the flowers in the pots and I love everything. The little postcard is one from my Nanna and it is a picture of Peggy Guggenheim sitting on her bed. 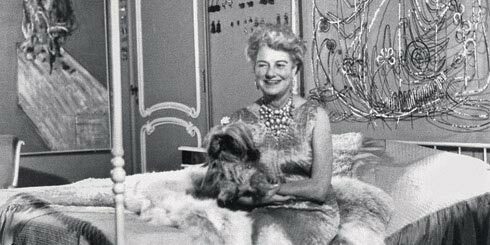 I love Peggy Guggenheim. Here is a close up of the postcard. I really treasure it. Upon seeing the second photo, my first thought was "I sent someone a letter on that stationary recently! Funny Minna is into that painting!" And second thought was "oh right, I sent it to the lovely Minna!" Also, I love your Annie Hall thoughts. Gorgeous <3 where did you get the Annie Hall poster if you don't mind me asking? There are lots more different ones though, just search Annie Hall poster! Next I want to get a 'Sleeper' poster..!